This comic is for all intensive purposes... dead. I am sad to say it, though. It remains in my reader because... well... because I am lazy and do not like to get rid of things that I liked. Not to say that it is a finished work, but because it has not updated in two years. It is a bit nostalgic to go back and read through it again. By the end he really had a nice clean style going and fully defined characters. There were a few pretty dramatic perspective shots that he did too... and nice coloring when it had it. Follows two kids and their dad, an owl, and his friend a bear. Kind of slice of life I guess. There is a lot of humor in it; situational and stand up. Deals with work and raising kids and space. You know, normal stuff. Anyway, here is the doodle. Sketched out in graphite, scanned into Photoshop, converted to line art in illustrator, and then imported into Photoshop again and colored in gray-scale. 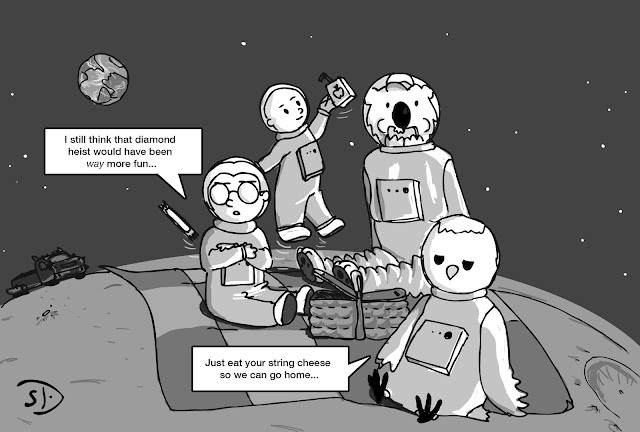 I had an idea that I wanted to draw a space picnic. I drew the overly smart daughter, Daisy, first and knew I wanted Steve the bear to be eating... The other two, Cooper, the boy, and Mr. Owl fell into place after. Tried to make it a little continuous with the last strip. I had a lot of fun with this... the limited palette was kind of liberating since I sometimes have difficulty mixing and matching colors.